As children did anyone really like mince pies? Come on, own up. You had one to appease mother and forced it down. Along with Christmas pudding. Mum quickly realised that making an enormous pudding was going to be a fairly pointless thing to do year in year out – I mean – mum loves it, but I’m pretty sure even she would be bored of eating the leftovers well into January. So the annual Christmas pudding stirring ritual gradually came to an end and the new lighter and smaller Christmas pudding was born and is, I think, finished before NYE. It was the same with mince pies, Mum made piles of them only to find we ate about three and a half each and she was left with yet more freezer fodder for next year. The bonus with mince pies and the homemade mincemeat that goes into them is that the older it gets the better it gets. 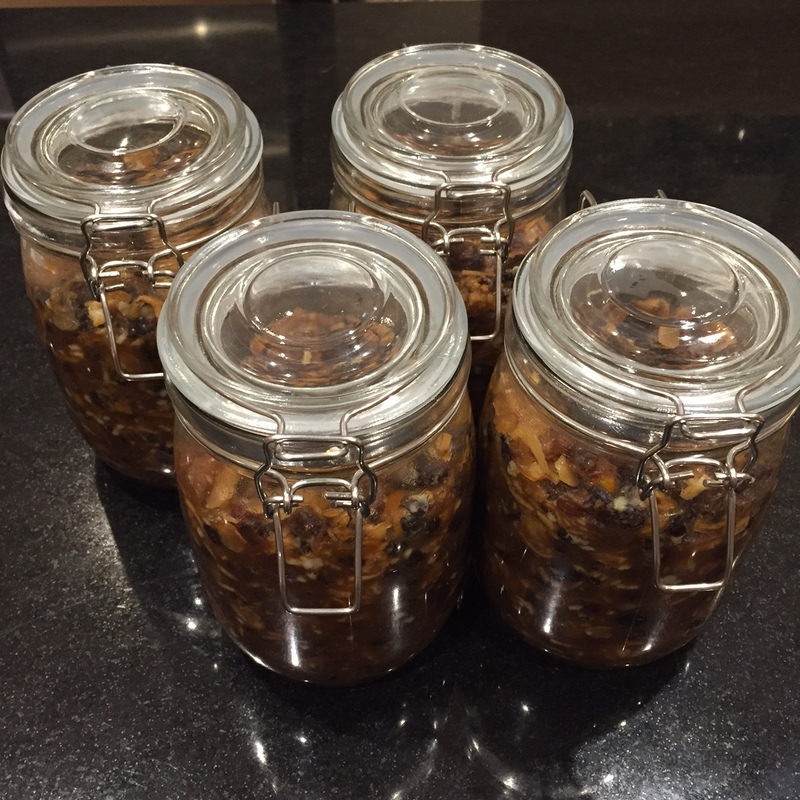 So, now we are all grown up and fully appreciative of what can only be described as ‘antique’ mincemeat the jars that mum has made for so many years are being put to good use! This is a recipe that I’ve been given by my mum who was given it by her mum. Granny Sheila, who was a wonderful cook, religiously made mincemeat, and I’m told that when she and Gramps moved from their family home to a smaller flat a few years ago, she insisted on the mincemeat (kept under her bed) moving with her! Consequently we only recently came to the end of the 1985 batch. I’ve tried to keep as close the recipe I was given as possible, but I’ve adapted it so it’s in ‘modern money’ (grams not pounds) and to work for someone (like me) who basically would never use pretty much any of the ingredients in it except to make this recipe, so you don’t have a tiny handful of mixed peel lying around your cupboard for a year or two. You will need 3 x 1 litre Kilner Jars – I bought 4 x 700ml Sainsburys own version. I suggest, given from the leakage I experienced, you buy the proper Kilner jars and hope they don’t leak! VERY Large Slosh of Whiskey! Leave about an inch at the top of the jar (mum told me to leave less but this is what happened when I topped the jar up) – see, expansion. And that stuff; ladies and gentlemen, is seriously sticky!! Obviously this recipe takes the food well passed the “Best Before” dates of all of the food, but with the booze and the way it is stored there shouldn’t be any beasties lurking in the jars to make you ill. But if you’re worried, don’t make this and then sue me, go and buy Mr Kipling’s Mince Pies – I’m told they are great. Guinness, eh? Now there’s a thought… I might try doing some alternative versions this year and take a poll… Thanks! Out of interest, what was different in the original ingredients? Guinness wasn’t in the original recipe, I just added it as a bit of a nod to Granny’s Irish roots. You don’t cook it at all?